Proprietary Name: Bdr Protect Ultra Hydrating Anti-pollution Skin Defense Mist What is the Proprietary Name? Non-Proprietary Name: Panthenol What is the Non-Proprietary Name? 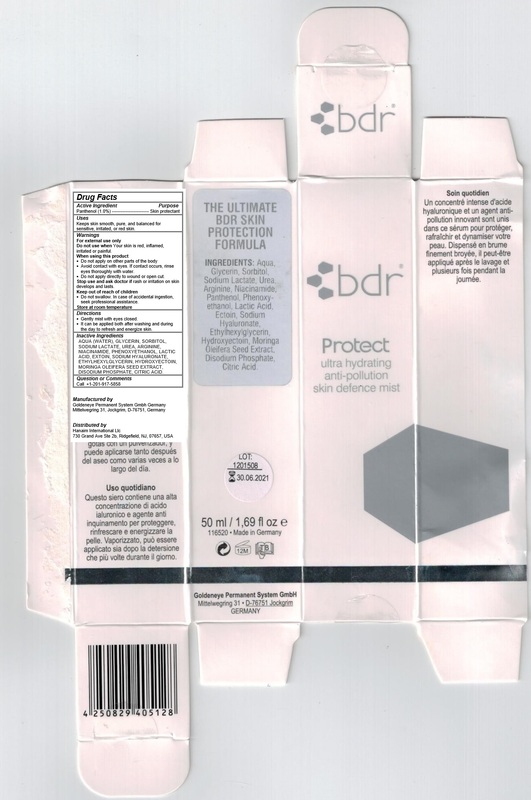 Bdr Protect Ultra Hydrating Anti-pollution Skin Defense Mist with NDC 71056-118 is a a human over the counter drug product labeled by Hanaim International Llc. The generic name of Bdr Protect Ultra Hydrating Anti-pollution Skin Defense Mist is panthenol. The product's dosage form is spray and is administered via topical form. Keeps skin smooth, pure, and balanced for sensitive, irritated, or red skin.  Avoid contact with eyes. If contact occurs, rinse eyes thoroughly with water.  Do not apply directly to wound or open cut. Stop use and ask doctor if rash or irritation on skin develops and lasts.  Do not swallow. In case of accidental ingestion, seek professional assistance. Gently mist with eyes closed.It can be applied both after washing and during the day to refresh and energize skin. AQUA (WATER), GLYCERIN, SORBITOL, SODIUM LACTATE, UREA, ARGININE, NIACINAMIDE, PHENOXYETHANOL, LACTIC ACID, EXTOIN, SODIUM HYALURONATE, ETHYLHEXYLGLYCERIN, HYDROXYECTOIN, MORINGA OLEIFERA SEED EXTRACT, DISODIUM PHOSPHATE, CITRIC ACID.